You are here: Home / Looks / Belén Rueda in Malaga Film Festival. Belén Rueda in Malaga Film Festival. Habitual of the Red Carpet, Benjamin Friman, designs another dress for a celebrity and this time it was one very special for him. Belén Rueda, was going to wear a dress of him, in which, as a creative director, he turned all his potential as a designer. 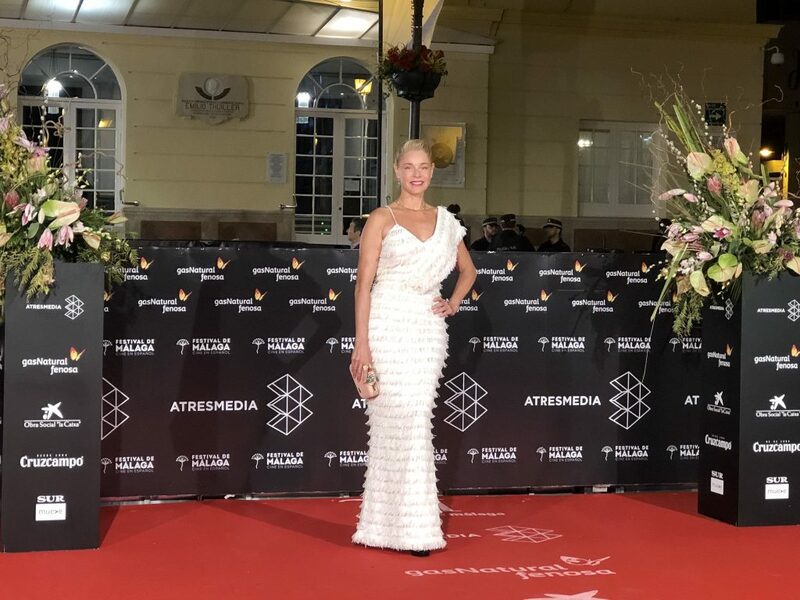 She attended the 21st edition of the Malaga Film Festival, where Juan Antonio Bayona was awarded with the “Retrospective-Malaga Hoy” award and which, of course, Belén Rueda could not miss, for being the protagonist of “El Orfanato” one of his most famous movies. Belén Rueda vestida de Benjamín Friman en el Festival de Cine de Málaga. Benjamín Friman captures the feelings of his women and the stage, both personal and professional that may be happening and that is where he gets the inspiration to design according the person and the moment she is living; he felt her happiness, both for her professional success and for the special phase she is living on the sentimental level. The design was very clear in Benjamín´s mind, it should be original and different, made of natural silk fabric with small fringes mixed with soft golden lurex, asymmetric with the intention to break the alignment of the fringe, which is repeating throughout the entire dress. It had to be pretty low-cut to exhibit her wonderful clavicle. Once again, Belén became the extraordinary woman she is, radiant of happiness, sure of herself and feeling beautiful and elegant. These are the most important signs of identity of a Friman’s woman. The Malaga Film Festival is gaining more and more strength in the Spanish Film scene, and even more relevant outside our borders, so this make that our actresses strive hard to look elegant and beautiful on the Red Carpet which it’s becoming more important, so they are try to look great in such special moments as could be, presenting their films or awarding prizes. Foto publicada en Instagram del Festival de Cine de Málaga. From Benjamín Friman we are very happy of having dressed, once again, an actress as special as Belén Rueda is. https://benjaminfriman.com/wp-content/uploads/2018/04/DA24BE8C-20C6-4AE5-A0EE-BC38250BC2E7.jpeg 737 1003 ROI https://benjaminfriman.com/wp-content/uploads/2019/02/logo_benjamin_friman-1.png ROI2018-04-20 11:04:052019-02-12 14:07:31Belén Rueda in Malaga Film Festival.